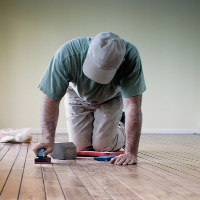 At Flood Fire Pro Inc. we know you don’t need a disaster to treat your home to thorough floor restoration. Our licensed technicians can restore the luster and shine to your ceramic-tile floors, walls, or backsplashes. We’ll also strip, wax, and buff your hardwood or parquet floors until they gleam. Our process includes virtually no odor or dust, leaving our clients happy and worry free! Enjoy the new life a restored floor can bring to your living spaces. Call us today.